Type in the name of a favorite artist and, in a matter of seconds, music by that artist (and similar artists) will be streaming to your desktop  and it will keep playing as long as that browser window stays open. 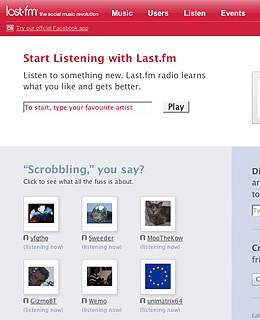 If you take the time to register and download the last.fm application, the service will dig deeper into your musical life, hook you up with its rapidly-expanding social network and match you with other users who share your musical tastes. Every time you play a song on your computer, last.fm takes note, adding the metadata to your profile. These "scrobbles" are shared with those you designate as your friends; they also help make last.fm a better DJ. MOG, another music site-turned-social network, works in a similar way, keeping tabs on what you listen to, making recommendations and connecting you to other "moggers" who share your tastes. MOG TV (click the Watch tab on the home page) adds music video mashups to the mix. Pandora, another personalized radio service  and a Time.com 2006 best-site pick  recently launched a mobile version that turns your Sprint cell phone into an MP3 jukebox for $3 a month. Use your handset's Web browser to go to Pandora.com to download it.